With increased popularity of online shopping, industrial hand tools manufacturers have commenced making changes in their retail strategies, and have been adopting omni-retail channels. Entering the e-commerce platform, these manufacturers are now offering various products on the basis of customer requirements. A major goal of manufacturers in leveraging the e-commerce is to expand their customer base across different geographies, devoid of physical occupancy in that specific country. This will further help them in bolstering their sales in the near future. Increasing automotive repair and maintenance activities is considered to be one of the major factors driving demand for industrial hand tools. As the automotive industry comprises both manufacturing as well as service units, it is constantly prone to the technological innovations. This further prompts automotive manufacturers in developing vehicles equipped with advanced and upgraded features. Incorporation of advanced features is in turn likely to propel complexities in the vehicles, thereby creating demand for advanced and multi-purpose hand tools along with the requirement for trained professionals. This expansion of the automotive aftermarket is expected to drive need for automotive hand tools as well as the mechanical tools in the foreseeable future. The global market for industrial hand tools is slated to exhibit a moderate growth through the forecast period (2017-2026), according to a recently developed report by Transparency Market Research (TMR). Nearly US$ 14,000 Mn revenues are estimated to be gained from worldwide sales of industrial hand tools by 2026-end. North America and Europe are anticipated to remain the largest markets for industrial hand tools, with revenues from these two regions collectively projected to account for over two-third share of the market by 2026-end. Robust expansion of the construction sector, along with increasing government focus on infrastructure development will remain major factors influencing the market growth in North America and Europe. The industrial sector in the Middle East & Africa (MEA) is projected to witness a substantial rise in the upcoming years on the back of the region’s gradual economic recovery. In addition, among various countries in the Asia-Pacific excluding Japan (APEJ), China and India are anticipated to play a fundamental role in fuelling progress of the region’s industrial sector. This can be mainly attributed to rapid technological advancements, along with low operational and labor costs in these countries. The industrial hand tools markets in the MEA and APEJ are projected to register the fastest expansion through 2026. Rapid expansion in the residential and the commercial construction activities, coupled with growing demand for wood-based products have created an incessant demand for general purpose hand tools. General purpose tools are expected to remain the most lucrative product in the market, followed by metal cutting tools. Although retail sales are estimated to remain dominant sales channels for industrial hand tools, online sales of industrial hand tools will exhibit the highest CAGR through 2026. Distributor sales of industrial hand tools will account for the smallest revenue share of the market during the forecast period. The global market for industrial hand tools is fragmented and characterized by the presence of many hand tools manufacturers, with most of the players competing for gaining maximum revenue shares. This has further intensified the market’s competitive landscape. Well-established international players currently dominate the market. Vendors in the market are focusing on the expansion of their footprint across emerging economies including India and Thailand. Leading vendors in the market are increasingly concentrating on the acquisition of smaller enterprises in order or enhance their product portfolio. Key market players profiled by TMR’s report include Xinapse Systems Ltd, Siemens Healthineers, Toshiba Medical Systems Corporation, Mirada Medical Limited, Sciencesoft USA Corporation, Mim Software, Inc., Wera Tools, Stanley Black Decker, Snap-On, Klein Tools, Kennametal Inc., JK Files (India) Limited, Channellock, Inc., Apex Tools Group, and Akar Tools Ltd. Saving time and improving safety are two major focus areas of industrial hand tool manufacturers across the globe. It is considered that demand for multi-purpose tools will prevail, with professionals seeking reduction in the number of tools they carry, thereby making versatility a key requirement. In addition, safety and ergonomics will continue to be the prime considerations when it comes to industrial hand tools design and development. Tool control and asset management are emerging as a cornerstone for companies, as they offer more efficient operations at reduced costs. Transparency Market Research (TMR) has recently published an insightful report on the global industrial hand tools market. The report gives forecasts on the global industrial hand tools market, while examining the market in detail and providing crucial dynamics influencing the market expansion. In addition to the provision of intelligence on the latest market trends, curbing factors, and driving factors for growth of the market, study regarding the data associated with multiple market parameters is included in the report. 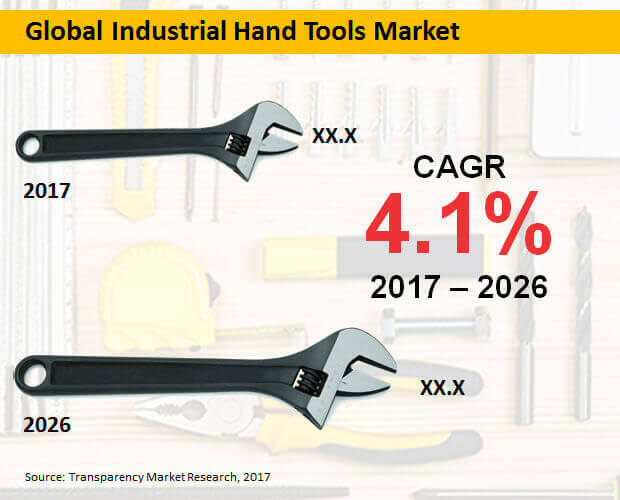 The report’s begins with a chapter titled “executive summary” that gives a summation of the global industrial hand tools market, along with information on important market numbers such as the historical (2012-2016) and the forecast (2017-2026) CAGRs. The market numbers provided are related to the market segments included in the report. A chapter titled “overview”, which is subsequent to the executive summary, incorporates a formal definition of “industrial hand tools” that trails a concise market introduction. The overview clearly describes wide scope of the global industrial hand tools market. Few chapters in the report deliver information about the pricing analysis and the cost structure associated with the global industrial hand tools market. Moving further, the report delivers forecasts on the global industrial hand tools market on the basis of a segmentation analysis. Classifying the global market for industrial hand tools into three key segments viz. product type, sales channel, and region, the report offers the market numbers associated with these segments based on the market share comparison, the revenue comparison, and Y-o-Y growth comparison. Global industrial hand tools market has been regionally branched by the report into Latin America, North America, Middle East & Africa (MEA), Europe, Asia-Pacific excluding Japan (APEJ), and Japan. A meticulous analysis with regard to the global industrial hand tools market’s competition landscape is provided in the report’s concluding chapter, which engulfs information about the prominent industries significantly underpinning the market expansion. The occupancy of the market participants has been traced, and these market players have been profiled by using an intensity map. Identifying key market participants exhaustively, this chapter gives insights on the basis of SWOT analysis, company overview, key developments, key financials, and product overview. A robust research methodology, tested & proven, has been used by the TMR’s analysts for developing the report on the global industrial hand tools market. The research methodology used helped the analysts in providing accurate insights on the global industrial hand tools market. Depending wholly upon the secondary as well as the primary researches, the research methodology has enabled extracting imperative information related to the market. This information compiled is then validated thoroughly by TMR’s analysts numerous times, so as to ensure the report’s authenticity, making it a reliable and an authoritative reference for the report readers.